For more running routes see the route list. The best place in Munich to run on dirt trails among woods and lawns is definitely in the wonderful Englischer Garten park. The park is huge, and fairly informal, and is easy to get to as it touches town center. The park is fairly simply laid out, just trees and grass, with a few fast-flowing streams winding through. There are no carefully landscaped flower gardens or other fancy features, but locals use it as their favorite hangout on nice weekends and evenings. 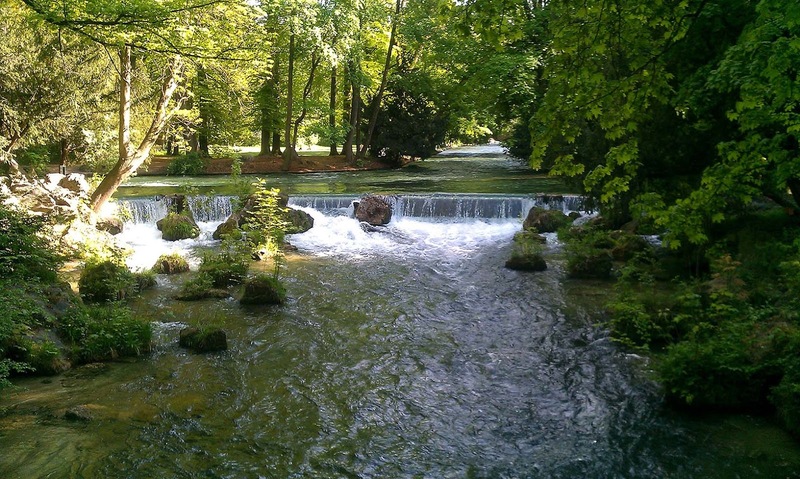 So if you want to run in nature, the Englischer Garten is the place to be. Not bad in the Englischer Garten! One uniquely Munich feature that the park does have is the Biergärten that dot the landscape. So make sure you come back after your run to indulge in Bavarian food and mega-sized 1-liter beers. The park is about six kilometers long, stretching north-south along the Isar River. The southern half, near the town center is by far the most-visited. A busy road, the Isarring, cuts the park in two, and the northern half is much emptier, quieter and is left more natural. So, if I've talked you into it, get to the corner of Prinzregentenstraße and Wagmüllerstraße, where the south end of the park begins. This is also perhaps the most famous spot in the park, where the local surfers ride the standing wave in the swift Eisbach stream. You'll find a group of surfers and lots of onlookers there day and night. The Eisbach (translated: Ice Stream) is an artificial stream created by rerouting some of the nearby Isar's water towards the park to provide scenic streams and ponds. The stream soon splits into several parallel streams that head northward, sometimes recombining, sometimes exiting back into the Isar. After taking a look at the surfers, turn north and head up the main path into the park. After crossing the Eisbach as it heads northeastwards, you'll come to a big lawn. Due to its closeness to the town center, this is the place where most people come to picnic, throw frisbees, play volleyball and relax on nice days. The main lawn: crowded on a nice evening! There are a variety of trails that all head the same direction, northwards, with trails on the eastern edge, along the west and in the middle, following the streams. We'll keep along the eastern side of the park, here, and return southwards along the western side, just for a bit of variety. The wider paths include a lot of bicycles, the narrower paths are just for pedestrians: take your choice. The Chinese Tower: a place you have to come back and try out! Still heading north, you'll cross a lightly-traveled paved street, which is just open to bikes and buses. Keep heading northward along the park's eastern edge, and you'll see a little lake coming up on the left, the Kleinhesselohersee. This is another cool hangout, with pedal boats, another beer garden and lots of ducks and geese swimming about. Just past the lake is where the southern half of the park ends. The Isarring road bisects the park here. NOTE: If you want to shorten this route to 5 kilometers, just follow the curve of the lake around to the west side of the park and head back to the start from there, staying in the southern section. To continue the 12.5-km route, you'll see a pedestrian bridge going up over the road, right across from the pedal-boat rental boat-house. Take that bridge, then keep to the right again until you see another big beer garden, Hirschau, where you turn northwards among more lawns and woods. The trail will head towards the northeast, bringing you closer to the eastern side of the park. But the landscape is quieter and emptier here. If you want to get away from the crowds, this is the place to do it. In the north end of the park there are also main paths along the east side, the west side and in the middle, where bicyclists also ride. And there are still further paths between them for walkers and runners. This part of the park also borders directly on the Isar, with a path next to the river, if you'd like to see a bit of it. The nicest paths, I think, are the ones that line either side of the Oberstjägermeister stream meandering up the middle. The lawns here are not cut as often as in the south, sometimes looking more like a lush meadow. And you might even find sheep grazing in blocked-off areas. A few bridges and a dam cross the river along the north section. There is an electricity-producing dam and then a pedestrian bridge over the Isar. Even the river looks more natural here: there is more woodland along the other side. When you get to the northern edge of the park, the trail turns to the left: another road blocks the park here, the Föhringer Ring. NOTE: If you want to add even more distance to the run, you can keep running northwards out of the park along the Isar riverside for many more kilometers! The Oberstjägermeister stream is dammed-up here at the north end, to form a few little ponds. It's time to follow the trails to the west and then turn southwards to take a parallel trail back home again, perhaps along the other stream, the Schwabinger Bach. Did I say it was more relaxed in the north end? Now just head south all the way back to the pedestrian bridge over the Isarring, and now stay west of the Kleinhesselohersee (lake) and head south through the southern section of the park. After a while, you'll pass the main lawn with all the people hanging out, and rejoin the surfing observers. Now that was a nice stretch of green right in the middle of the city!